Jeff James (jeff54james @t btinternet.com) of Sidcup has been working on the First Surrey Rifles and their association with Herts. The FSR have more to link them to Herts than to their origin in Camberwell. He sent the following notes he had made 'A War Record of the 21st London Regiment' published on the 25th December 1927 [currently available as a reprint]. August 1914, from bivouac in Hyde Park they marched to billets in St Albans. Transport had difficulty on the steep hills of Shenley Ridge. September 18th the First Surrey Rifles and other units of the 2nd London Division marched past HM the King and on the 29th September the Secretary of State for War – Lord Kitchener – inspected the division at Gorhambury Park. Lord Roberts also visited the parade ground on Holywell Hill. There were firing ranges in Gorhambury Park. 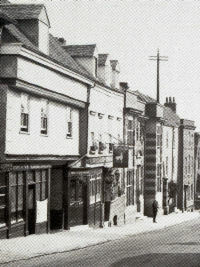 In October 1914, the officer’s mess was established at the Red Lion Hotel. Sunday Church parades were held at the Abbey. Military exercises were held around the St Albans district. Christmas 1914, in St Albans, then to Harpenden, early 1915. From Harpenden railway sidings, March 14th 1915, to France. Spring 1915, St Albans for six weeks. Billeted ‘in a wretched district called Sopwell Lane’. Battalion HQ at the White Hart. Training runs through St Albans and Sawbridgeworth. Summer 1915, Sawbridgeworth – ‘a golden time’. HQ in a large house called ‘Hatters Croft’. The Red House also, and Spels shop in Sawbridgeworth. Early September 1915, at Hockerill Camp on high ground above Bishops Stortford. Then to France, via Warminster, sailed June 25th 1916. In addition, the 1st Battalion enjoyed a pantomime at St Albans County Hall [Town Hall? ], Christmas 1914, entitled 'Mary and her Little Lamb'. The impression is that the stay of both battalions in Herts was good and in part due to the reception given by the locals. The stay in camp at Sawbridgeworth, 2nd Battalion, being described as a 'golden time'. This view given in the summer of 1915 may have been coloured by the reports of the previous years fighting and they were aware of the dangers that awaited them. 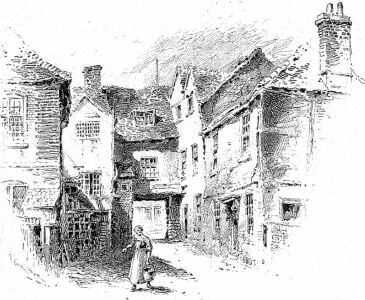 Spels shop at Sawbridgeworth, reading between the lines of the text, was a popular eatery much favoured by the FSR. It drew this recorded comment from an officer - ' you're too well fed, that's what you are'. Are you able to find Hatters Croft and The Red House? 1st Surrey Rifles Sports and Recreation. Several shots of soldiers during some kind of diving and balancing content. A group of soldiers are crowded onto a bridge over a river with a large building behind them. A man in an old-fashioned swimming costume stands on a high, makeshift diving board and dives into the river. The next man walks slowly along a lengthy pole that sticks out over the water. The object seems to be to try to get to the end before losing your balance and falling in. Several others follow. Some are able to turn their fall into a dive while others just plop into the water. 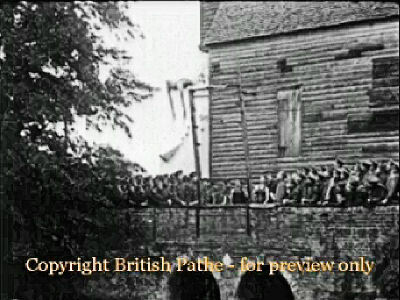 Pathe News have a film archive which shows the First Surrey Rifles 'at play'. It may be possible for you to identify the location. 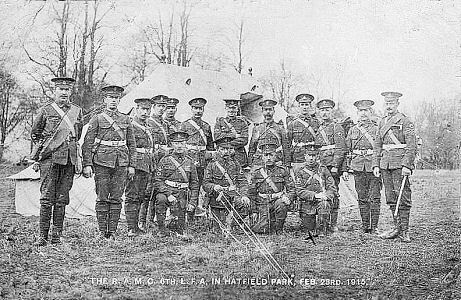 I have included a photograph of my Uncle Ben, at Hatfield Park, with the 6th LFA. He was a bandsman with the First Surreys after the war. He was the eldest of eight children. My father was the youngest. 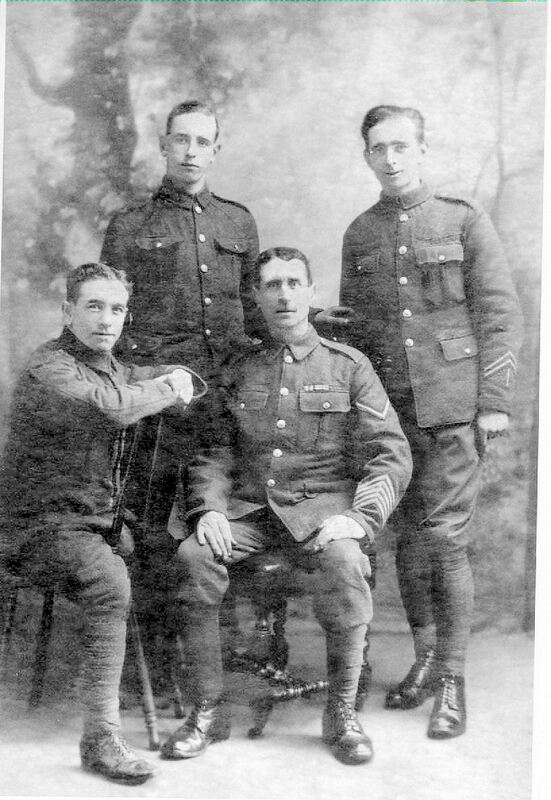 I have attached another photo with Uncle Ben sitting on the right hand of his father and with two brothers. My grandfather, Benjamin Samuel James, fought with the Berkshires in the Sudan, at Suakin and Tofrek. He signed up for WW1 and put his age as 40, He was 54 at the time. I have checked my book, The London Gunners come to Town and the First Surrey Rifles only gets a passing references in a list of units in the 2nd London Division, although there are extensive references to more general activities of what became the 47th Division. It is not practical to check my very extensive manuscript notes when researching the book, but there is a possible reference in the book. You may have already seen Military Exercises (an extract from the book) and noticed that it involved the 6th London Field Ambulance - so presumably your Uncle Ben was there. When I was researching the book this was a lucky find. The reason was that while war diaries were started when the 2nd London Division moved to war stations in Hertfordshire the powers that be later assumed that the war diaries of units training in England would be of no interest and they were destroyed. As the diaries were kept on a monthly basis those for March 1915 were kept because the Division went to France during the month. However in checking the files at the National Archives I discovered the plan for the December exercise misfiled under March! The location is probably the fields by the River Ver, below the Cathedral (where the sports stadium is now) looking west towards the big houses that overlook the valley from King Harry Lane. If so the big house in the middle background is presumably Campbellfield (see map above). This area is close to the First Surrey Rifles H.Q. in Holywell Hill. 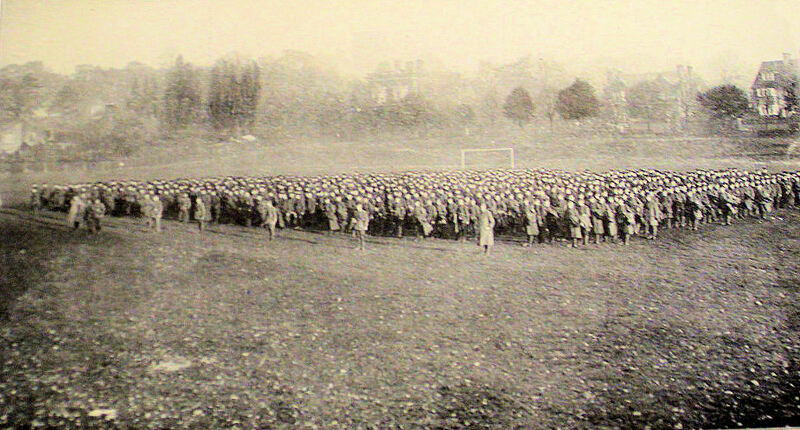 Jon Mein (December 2013) suggests that the above photo of the Imperial Service Battalion was taken on the former St Albans School playing fields at Belmont Hill. The large house in the middle background with multiple chimneys would therefore be Torrington House - close to the site of Holywell House owned by the Marlboroughs/Spencers well into the 1800s. It would have been close to the White Hart HQ. The pictures on the left (from two mid 20th century town guides) show Hatters Croft, as it was called at the time the First Surrey Rifles were there. 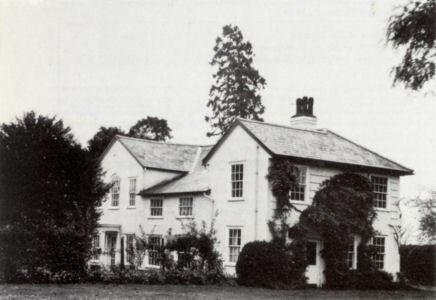 At the time the pictures were taken it was the town council offices and had been renamed Sayesbury Manor in 1939. 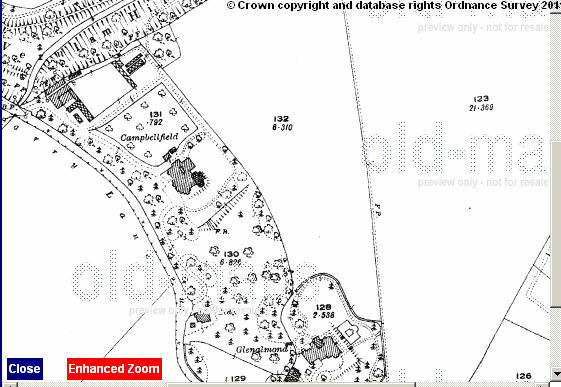 It is at 1 Bell Street, Sawbridgeworth and is a listed building. 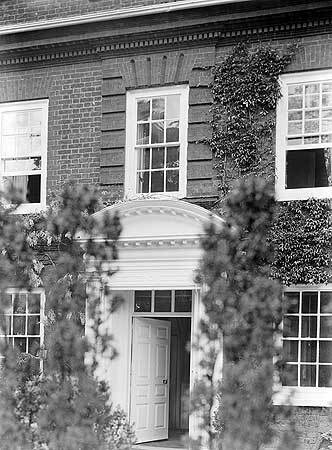 The Red House (picture below) also still stands, at 16 Bell Street, and is a listed building. The reference to "Spels" is less clear cut. 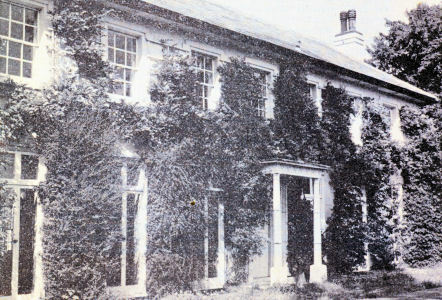 Edward Spells was the beer house keeper at the Good Intent, Barkers Lane, Sawbridgeworth in 1894 but had left by 1901. The Good Intent was still open some ten years ago but is now listed as a former pub, with a photograph showing the building undergoing building work dated 2008. In 1912 there was another Edward Spells (son of the above) in Sawbridgeworth but he is listed as an electrical engineer in the 1911 census and trading as a fancy repository in the 1912 Kelly's Directory. I cannot identify the Pathe News film but suspect that the description with it could be misleading. I suspect that the building is a large mill and the two archways are actually the outflows from a mill race. I am sure it is not a mill on the River Ver at St Albans, and while I do not know Sawbridgeworth well I very much doubt doubt that it is a bridge over the River Stort.